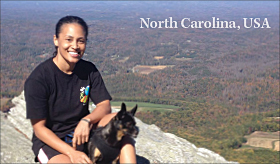 Gwen Ford, a transportation GIS analyst for the High Point Metropolitan Organization, enjoying the view from the top of Moore’s Knob (2,579 feet) in Hanging Rock State Park, Danbury, North Carolina, with her dog Mr. T. She and some friends visited a memorial to a mutual friend who passed away in July 2014 while hiking up the trail. The weather was perfect, and the views were amazing! 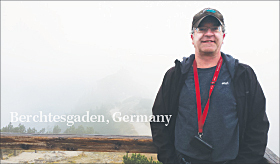 Dan Seidensticker, a GIS specialist for the Madison Area Transportation Planning Board, wearing an Esri T-shirt and cap, in Berchtesgaden, Germany, near the Austrian border. In the background, buried in clouds, is the Hoher Göll, the highest peak in the Göll mastiff and the site of Kehlsteinhaus or Eagle’s Nest, a teahouse built at 2,300 feet for Adolf Hitler’s 50th birthday.